This fudgy frosting is perfect for spreading over cookies for a chocolaty delicious finish that is stackable. Your cookie trays just got an upgrade! If it is a holiday or a fun party that included an advanced invitation, there will likely be fun sugar cookies. People love them! So for our Easter brunch, I knew I had to make something fun. I already did bunnies, carrots, chicks and flowers last year so I wanted to do something different this year. Then it hit me. Donuts! They would be so quick and easy to make and would be the perfect brunch cookie! The thing is donuts need to have a rich chocolate frosting and plenty of sprinkles. I mean, that is how they are best. But there aren't a whole lot of great chocolaty cookie frosting recipes out there that allow you to stack the cookies and I tend to use up all of my serving space as it is. I didn't want to go the route of just dying royal frosting to look like chocolate frosting. That would be a cruel tease! I certainly didn't have room for dozens of donuts to be single stacked everywhere. Then genius struck! The fudge that we dip our crescent cookies in at Christmas hardens enough to be stackable and is full of great fudge flavor. It would be perfect. A few minutes over the double boiler and the cookies were everything I expected. The frosting worked perfect and it made the cookies so delicious. I think donut cookies might be the new favorite! In a double boiler melt chocolate chips, butter and milk stirring frequently until the mixture is melted. Whisk in the powdered sugar until completely incorporated and smooth. While keeping the frosting warm, spread over cookies. 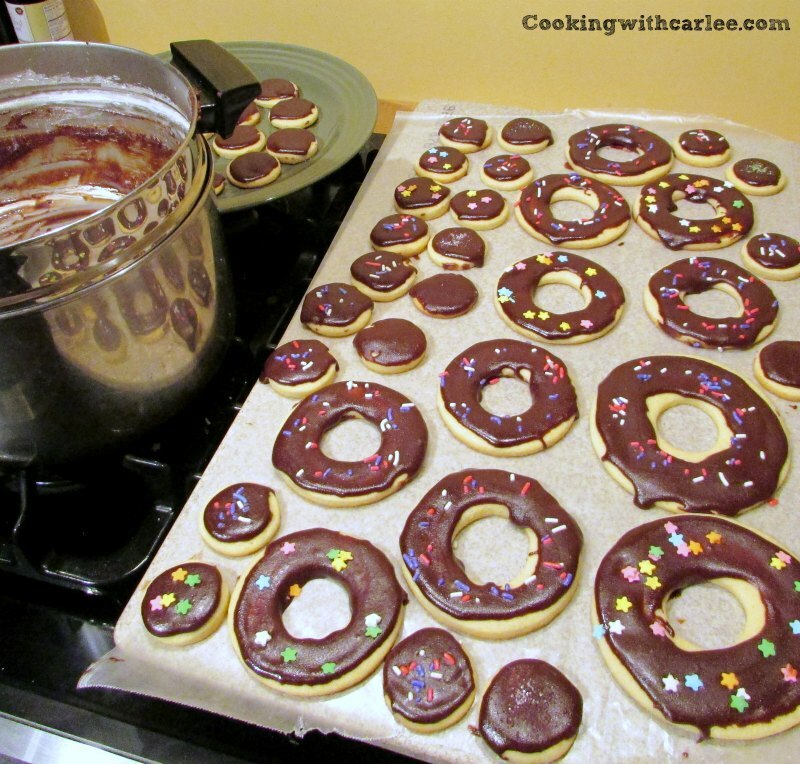 Add sprinkles if desired and place on wax paper in a single layer until completely set. Then stack and store in airtight containers. There they are...I had fingers crossed you were gonna share this recipe!! So pretty and looks easier than I thought it would be!! So creative, great job Carlee!! Ha! I wouldn't hold out on something this delicious! Thanks, Andrea! These little gems were really easy to do. It was by far the quickest batch of decorated cookies I've ever made! These look delicious- like the best of both worlds! Can't wait to give them a try, maybe pink for the next birthday party! I found you over at the link up at Miz Helen's. They would be so cute in pink! Thanks so much for stopping by! These are so cute. Yum! Pinned and shared. Isn't it fun to think of the possibilities? Your Stackable cookies look awesome, thanks so much for sharing with us at Full Plate Thursday! Thank you, I was really pleased with how they turned out! You're cookies look awesome! Thank you for linking up to the Tasty Tuesday linky party last week. i hope that you'll join us again this week. I love soft frosting too, but when you are making a ton of them they need to be able to stack without ruining them! I hope you two have a blast baking together! Carleex these look really fantastic. I love that they look like real donuts. And the cool thing is you can use the donut holes as smaller cookies. They look really good stacked up like that and the sprinkles are genius. 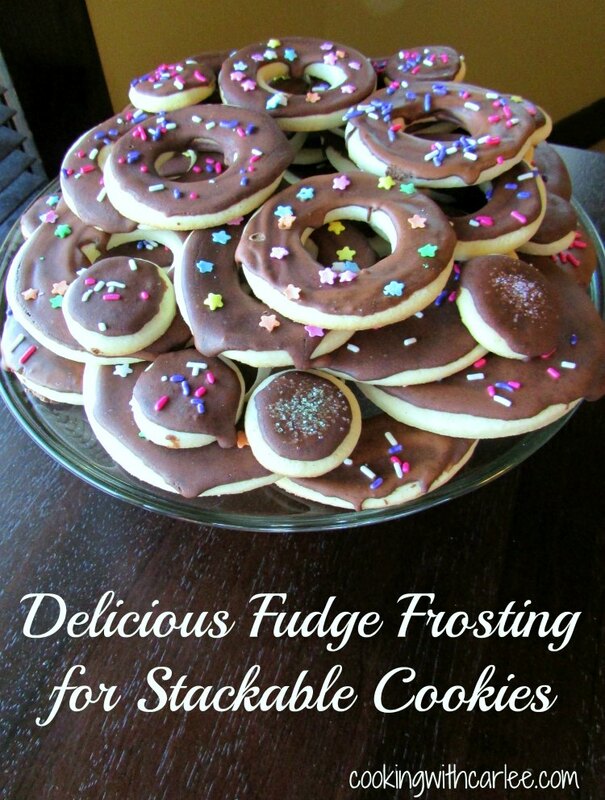 I am pinning this so that I have the recipe handy, this is a great find for stackable cookies. Thanks, Nikki! Originally I was going to make all donuts, no holes. Then I figured I could get them done so much faster (and have more tender cookies) if I baked both. The frosting was so easy and so delicious. I don't know why I didn't think to use it this way before! Next time I bake cookies, I have to try this! Please do, it is so good! This is great Carlee!! Sugar cookies are a favorite in this house so I will have to try your cookie and frosting recipes. Thank you for linking up at the April Country Fair Blog Party! I hope you love them! Thank you so much for hosting! These are great frosting tips and they turned out adorable! Pinning! Genius! I can't wait to give this a try! Hey Carlee! Love the super easy recipe! I like the fun play on a donut! Thank you for sharing at Funtastic Friday! Hope to see you again! Wow!!! These cooking look absolutely fantastic! I love that frosting :) Thank you for sharing this with us at #SaucySaturdays! Thank you! The frosting was the perfect fudgy balance to the cookie and they were great dunked in coffee!